"The power of holding two contradictory beliefs in one's mind simultaneously, and accepting both of them.... to deny the existence of objective reality and all the while to take account of the reality which one denies", George Orwell, 1984. Last Thursday the Prime Minister of Canada, Stephen Harper came to London and was accorded the honour of addressing both Houses of Parliament. One of the key aspects of the recent relationship between Britain and Canada has been the support our government has been giving to Canada's lobbying against the EU Fuel Quality Directive. This would see Canadian tar sands oil recognised as being more polluting than conventional oil and would make it much harder, if not impossible, for it to be imported into the EU; a move which the UK has steadfastly opposed. 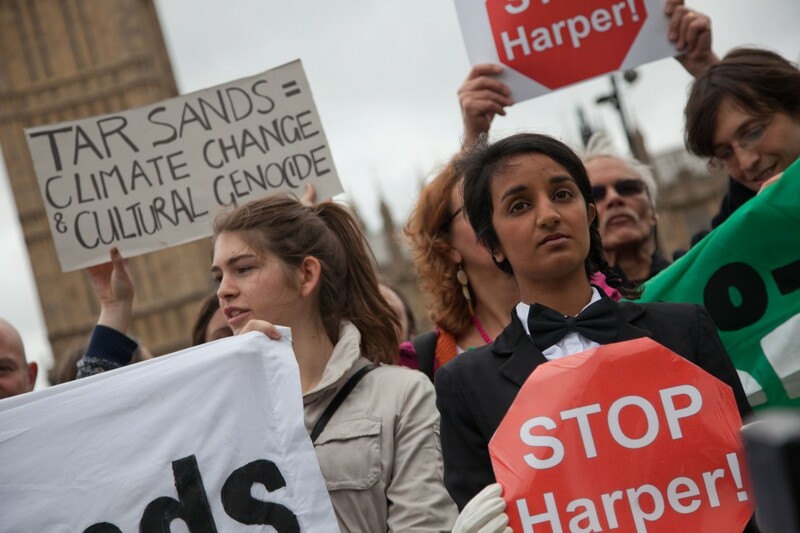 Harper was met with three protests, two outside Parliament and another on top of it as we added British voices to those of Canadian environmentalists and indigenous people whose land would be destroyed by tar sands development. In all, an area the size of England could be laid waste to extract the oil if it is fully developed. However with the difficulties Canada is having in establishing pipelines both to its own West coast and into America (KXL) to export tar sands oil, the EU directive could deal another body-blow to the development of this most dirty and polluting fuel. This is important for all of us because there is so much oil locked up in these sands, that exploiting it all would make it virtually impossible for us to avoid pushing temperatures well beyond the 2C which has been defined as the threshold for dangerous climate change. 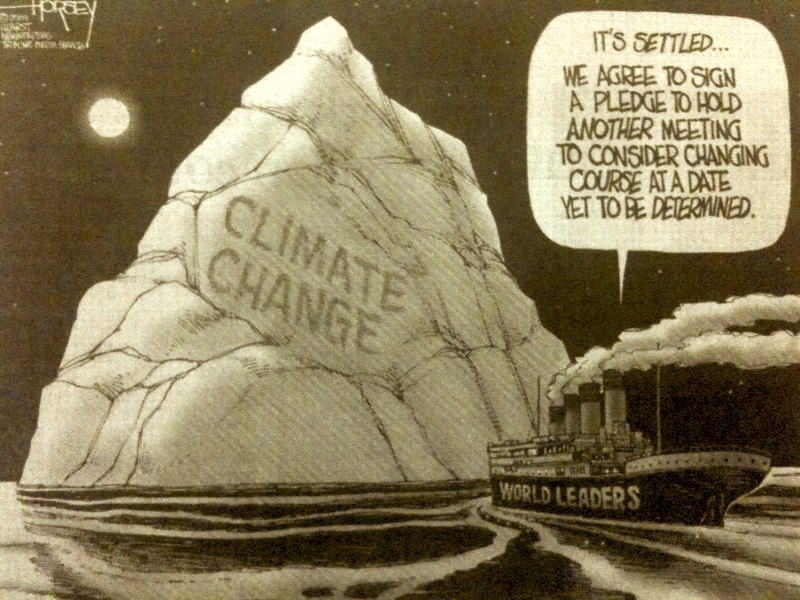 I'm highlighting this, not just because it is one of the most critical climate issues we face, but also because of the way it exposes the hypocrisy of our politicians. World leaders have for years signed up to statements of their commitment to preventing dangerous climate change, yet at the same time they apparently have no qualms about supporting developments which would make that threat a reality. George Orwell would recognise this as a classic case of doublethink. Similarly oil companies devote pages of their annual reports to sustainability, while simultaneously following a business plan based on the unsustainable exploitation of fossil fuel reserves. We have a government which still professes itself committed to the legally enshrined 80% reduction in our greenhouse gas emissions by 2050, yet which votes down an amendment to its Energy Bill which set a necessary decarbonisation target for 2030. A chancellor pushing a new dash for gas through fracking partly because of the jobs it will create and in so doing driving investment in renewable energy - which delivers far more jobs than gas fracking ever will - to a seven year low. All of this doublethink goes unchallenged by the majority of our mainstream media which has neither the wit, nor the will to highlight the glaring contradictions. Somehow we have to hold our politicians to account, but how? I wish I knew. 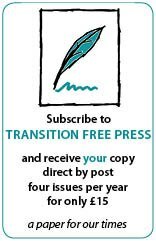 On May 1 the new national grassroots newspaper, Transition Free Press, published its second summer edition - 24 pages of full colour news and views, contributed by Transitioners and community activists working in the field. Ordinary people doing extraordinary things in all kinds of places: in the city, in the wild, in books, housing co-ops, small businesses, allotments, in the park, down the pub, on the (solar- panelled) roof, underwater, even on the netball court. Front page reports from the US, Greece, Spain, France and Portugal; in-depth features from Sheffield, Louth, Crystal Palace and Lostwithiel. As printed media struggles financially and the diversity of the world's free press diminishes, small publications like the Transition Free Press are now making their way through the cracks. It's key, the editors feel, that the presses keep rolling and our home-grown news is physical and visible and goes places that on-line media cannot reach. These shoestring publications provide a vital diversity in a world which is becoming increasingly monopolised and monocultural. However like CSAs and local businesses everywhere, small publishing ventures need the support and backing of regular customers. These are not mega-corporations with slick marketing operations and big budgets. The team behind the paper is a group of hard-working creative people starting from scratch on the kitchen table. So this 'community-supported media' requires the same generosity and loyalty people show towards community gardens, people's kitchens or food coops. Alongside many Transition projects within a REconomic frame, TFP is a social enterprise, so the paper needs to pay for the work that goes into creating it, as well as printing costs. 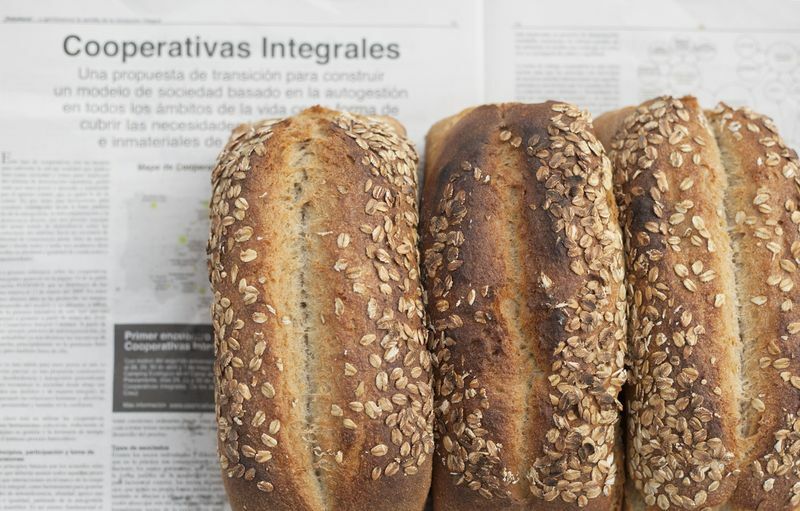 If the paper were a loaf of bread, you might not question giving £1 for an honest, artisan loaf. So maybe a good way to look at this kind of home-grown comms is to see it as real crafted editorial. Words you can't exactly eat, but neverthless nourish the mind and heart. While mainstream media are forced to squeeze staff, cut freelance rates and often push a hostile and corporate agenda, the paper looks resiliently and in an earth-friendly way at what is happening in the fields of energy and food, transport and education. It looks for the big untold narrative under the radar and reports on how local action is changing the world, the subject of co-founder Rob Hopkins' new book, The Power of Just Doing Stuff. The distributors - individuals, Transition Initiatives and local businesses - undertake to buy a bundle, so they can sell the papers and recoup their costs, as well as make some profit to plough back into their own publications. Local groups in Lewes, Bristol, Bungay and other places all create their own newsletters this way to sell alongside the national edition in farmers markets, local shops, cafes, at Transition events and summer festivals. This is not the only against-the-flow publication to have recently emerged either. Last month also saw the launch of the printed version of the excellent on-line magazine STIR. 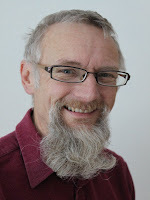 TFP's Jay Tompt writes about REconomy in the Transition Network column and editor, Charlotte Du Cann reviews Barbara Kingsolver's novel about climate change and poverty in the Appalachian mountains, Flight Behaviour. You can find STIR in selected outlets and also, like the Transition Free Press, by subscription. So if you see a copy do buy one and pass on the news to a place or a person who might benefit from a liberating read! Leave one in your library or local cafe, or give to a friend or colleague. If you live or work in Norwich, do get in touch with one of our distributors and put your hands on a real-life copy. If not, you can always subscribe for a year and receive one through the post. Energy underpins everything we do in our industrialised societies. 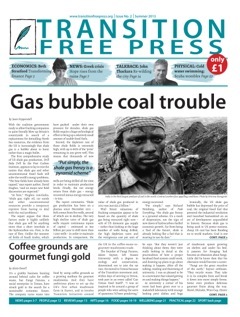 The high demand for gas, oil, coal or bio-fuels, as our front page story shows, is now costing the earth on which we depend for life. How we face this dilemma and reduce our need for power is the work of the Transition movement and thousands of community activists around the world. Most of us are invisible. But, like mycorrhizzal fungi in the living soil, we are connecting and communicating across the globe, working to bring about a future where people can live fairly within ecological limits. 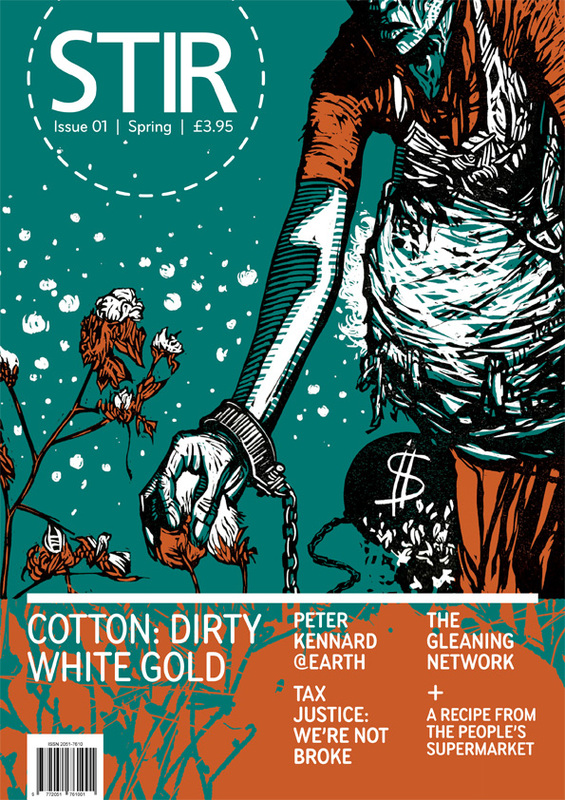 In our summer edition we publish stories you might not ordinarily see – actions communities undertake to bring back life into neighbourhoods, to activate soils that have been deadened and contaminated, to create new networks that can hold us together in challenging times. An infrastructure you can feel but not always see. 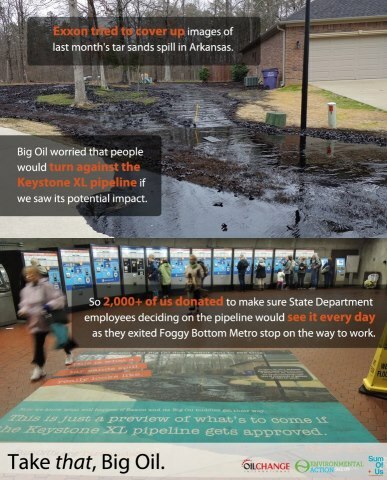 The proposed Keystone XL pipeline threatens to bring toxic crude oil through the heartland of America. Ancient trees fall to make a by-pass in a peaceful valley in Sussex. In response people rise up and take on mighty corporations and rapacious stakeholders. Sometimes that might is challenged. We won! wrote TFP columnist, Shaun Chamberlin, as the Ecological Land Co-operative finally secured planning permission for a smallholding in Devon. For a Goliath culture whose top-down business-as-usual worldview requires everyone’s assent, this may appear a small victory. But each time we voice our dissent, each time we reclaim our fields, we realise we are not alone in our task. Why to do we tell these stories? Because they are sparks that light a great fire inside us. Because another culture is being forged under our feet. In an abandoned warehouse in Doncaster people gather on a freezing night by a furnace to listen to a new narrative being told, along the River Dart a group of children and elders go on a story walk in search of the future. 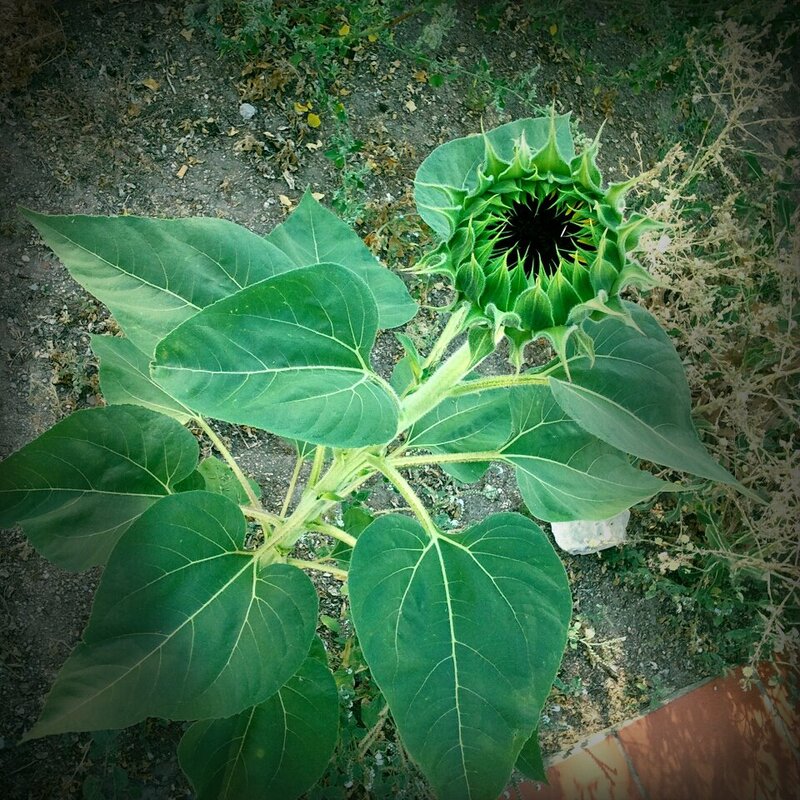 A sunflower garden appears in a neighbourhood in Portalegre. An artist plants 100 fruit trees in a university in Loughborough. In the cities everywhere, leaves appear through the cracks and are gathered by foragers. A dominant worldview does not mean we do not have agency. 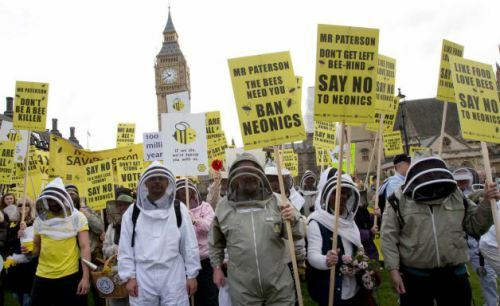 I’ve clicked to save the bees, e-mailed my MP about the NHS and even sent a letter to the President of Ecuador about oil drilling in their national forest. Plus I tweeted about the actions I had taken and shared the link on Facebook – what more do you want? With the dramatic success of Avaaz and 38 Degrees, plus the move into online activism of most of the major campaigning organisations, from Greenpeace to the WWF via Action Aid and Oxfam, it seems like our inboxes and social media sites are filled to bursting with petitions we can sign and emails to send all aiming to make the world a better place. Some of these gather hundreds of thousands, or even millions of signatures, demonstrating the popular appeal of campaigns to save the NHS or protect the Arctic. But just how much can be achieved through online activism and can we really change the world with the click of a mouse? Well there’s some evidence that they can have a significant impact. Take the UK government’s plans to sell off our forests to private interests. 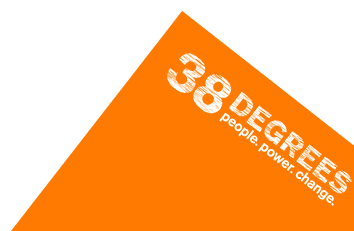 38 Degrees launched a highly effective campaign attracting lots of support and publicity such that the government first decided to appoint a review panel and then backed down completely on the sale plans. Tapping into the concerns of an already divided government this demonstration of people power proved far too much to resist. For every success though there are plenty of examples of campaigns which have just been ignored. One of the great strengths of the online campaign – how easy it is for everyone to participate – is also one of its fundamental weaknesses. If it’s so easy to participate it’s also easy for those on the receiving end of the demands to consider that the signer hasn’t really demonstrated any particular commitment to the cause. Many years ago it was explained to me by someone who had worked in an MP’s office that there is a clear hierarchy of communication and the attention it will receive. At the top is the handwritten letter, followed closely by a typed, hand signed letter. After that comes a one-off email and right at the bottom is the generically generated bulk email you can create with a few quick clicks online. The impact of the first of these I was told, was hundreds of times that of the last. So while the online campaign can a long way to raising the profile of an issue, on its own it probably isn’t going to change the political landscape. For that you need far fewer people but demonstrating a much greater involvement. It’s an inevitable fact that in order to gain leverage, a campaign needs to attract media attention, and this is much easier to do with people on the streets than it ever will be with online activism. 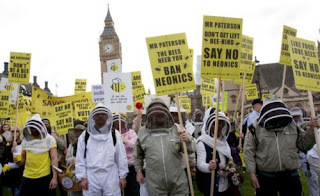 So that’s why this weekend saw protestors, many dressed in bee costumes, on the streets of London calling on the government to ban harmful pesticides. Their numbers were tiny by comparison with those that had signed an earlier petition or emailed the environment secretary; but their impact was far greater for being so much more newsworthy. I don’t in any way want to put people off participating in online activism. It has a valuable role to play and in the right circumstances can win significant battles; in addition to which it can help greatly to bring people to greater involvement in a campaign. I do however want to suggest that physically turning up at meetings and going to demonstrations is likely to have more impact and remains crucial in the delivery of a successful campaign. It shows real commitment to the cause and brings people together in a way which online campaigning can never do. Yesterday I received my copy of the New World magazine from the United Nations Association. The theme of this issue was ‘Can Technology Save the World?’ Initially, I thought the editors would answer the question in the affirmative – there being so many wonderful advancements in science and technology. One development that was mentioned in New World was the arrival of test tube meat. Apparently a team of Dutch scientists is very close to producing edible, lab-generated meat – with a product-launch planned for Spring 2013. If this happens, it will be at just the right time because the World Health Organisation (WHO) estimated that the global demand for meat will double in the next 40 years. The global population is, after all, heading for nine billion and because of rising standards of living – especially in Asia – more and more people are demanding meat to eat. According to the Food and Agriculture Organisation (FAO), livestock already account for 20% of greenhouse gas emissions, 10% of the world’s fresh water supplies and around half of all agricultural land. So producing meat the way we do now is unsustainable. How would we get on with artificial meat – also known as in vitro meat, cultured meat or test tube meat ? In vitro meat should not be confused with vegetarian foods such as Quorn sausages and other products. Most meat is animal muscle. The process of developing in vitro meat involves taking muscle cells from an animal and applying a protein that helps the cells to grow into large portions of meat. Once the cells have been obtained, additional animals would not be needed. As of 2012, thirty laboratories around the world have announced that they are working on research into artificial meat. Scientists have to make the product profitable for corporations in order for them to take this emerging technology into consideration and to invest in it. The challenge will be finding an industrial process, rather than a scientific process to make in vitro meat cheaper than conventional meat. Assuming that the proper materials are used and conditions remain ideal, two months of in vitro meat production could deliver up to 50,000 tons of meat from ten pork muscle cells. So, is it a technological challenge worth pursuing? Will it be enough to stave off food poverty in the coming decades as the world’s population increases relentlessly. Another technological ‘miracle’ is the fact that on-demand organ transplants have moved a step closer. Scientists have for the first time successfully engineered a synthetic kidney - a break through that could have massive benefits those waiting for donor organs. Scientists led by Harald Ott of the Massachusetts General Hospital in Boston created the synthetic kidney using an existing bioengineering process that has previously been used in the manufacture of artificial windpipes and in successful human transplants. Dr Ott is quoted as saying “ In an ideal world, such grafts could be produced on demand from a patients own cells, helping us overcome both the organ shortage and the need for chronic immunosuppression” (Independent 14 April 2013). It is estimated that some 100,000 people in the United States are waiting for a donor kidney. The above research will not yield a viable organ for human transplantation for a number of years yet, but the techniques used here are incredibly promising for future research and point to one day reaching the goal of being able to quickly manufacture new organs for those in need, something that could save countless lives. Greater understanding of genetics and micro-organisms is changing the nature of medicine. In fact, the whole advance of science and technology requires a context of effective regulation and supervision, as well as good government and international co-operation – rather than a complacent feeling that we can do as we like because technology will save the planet. One thing that will save the planet is some form of population control. There are just too many of us on this earth and our numbers are increasing to unsustainably. 2013 is predicted to see the biggest baby boom in the UK in 40 years. Nobody can work out the reason for this but adding an extra generation of consumers to an over-burdened planet does not seem the best way of going about things. Earlier, I mentioned the countless lives that organ growing would save, but wouldn’t this make the overpopulation even more dire? Martin Luther King had some wise words to say about population: "Unlike plagues of the dark ages or contemporary diseases we do not yet understand, the modern plague of overpopulation is soluble by means we have discovered and with resources we possess. What is lacking is not sufficient knowledge of the solution but universal consciousness of the gravity of the problem." Up to now, the subject of over-population has been the ‘elephant in the room’ – the subject that no one will discuss but that is changing – and the BBC (Radio 4) has hosted a series of talks and debates on the issue. It is time to listen and join in.